In the first of a new series, I look at some of the major figures featured in Jeanne Eagels: A Life Revealed. First up is Billie Burke: star of Broadway, wife of legendary producer Florenz Ziegfeld, she is perhaps best-known today for her role as Glinda in The Wizard of Oz. Back in 1912, Billie was starring in The Mind-the-Paint Girl, a play by Sir Arthur Wing Pinero, with Jeanne Eagels in a supporting role. Mary William Ethelbert Appleton Burke was born on August 7, 1884, to Blanche and William ‘Billy’ Burke, who worked as a singer and clown at the Barnum & Bailey circus. After several years touring America and Europe, the family settled in London, where in 1903, nineteen year-old Mary – or ‘Billie’, as she was known – made her debut on the West End stage. She returned to New York City a few years later, starring in a string of hit Broadway musicals, including Mrs. Dot, Suzanne, and The Runaway. On September 9, 1912, after a week trial run in Atlantic City, she opened at the Lyceum Theatre in Sir Arthur Wing Pinero’s ‘play within a play’, The Mind-the-Paint Girl. Her character, Lily Parradell, was the leading lady at a musical comedy theatre in London. She headed a cast of thirty, including an up-and-coming actress, Jeanne Eagels. Six years her junior, Jeanne was cast as ‘Olga Cook’ and had eight lines to speak. In her 1949 memoir, With a Feather in my Nose, Burke recalled, “One of the pretty young actresses in my play was Jeanne Eagels, to whom no one paid much attention then except to observe that she was lovely to look at and pleasant to have around.” That is why Burke’s husband-to-be, producer and owner of his own theatre, Florenz Ziegfeld, offered Jeanne a weekly salary of $100 to join his Ziegfeld Follies. As financially tempting as the offer must have been, she boldly rejected it. Determined to become a dramatic actress, Jeanne was not swayed by the lure of rhinestones, beads, feathers, and elaborate headdresses. Billie Burke’s screen debut, in Peggy (1915) was more auspicious, and she quickly became one of America’s most popular silent movie stars, in a series of roles similar to her character in The Mind-the-Paint Girl. Her daughter, Patricia Ziegfeld Stephenson, was born in 1916. Within a few years, Billie returned to the stage. In January 1923, Billie and Jeanne were among the guests at the home of Clara Novello Davies, as she welcomed her son, Ivor Novello, home from England. Shortly afterwards, the two actresses appeared together in a skit entitled ‘Nothing But Hits’, as part of the 41st Annual Actors Benefit at the Century Theatre. The event was a sell-out, with thousands turned away from the box office. The entire show was repeated at the 5,000-capacity Hippodrome Theatre, with a society pageant featuring the “Fashions of War” now included in the 50¢ to $3 ticket price. When the family’s savings were wiped out in the 1929 stock-market crash, Billie Burke considered a return to Hollywood. She made her ‘comeback’ in A Bill of Divorcement (1932), playing the mother of Katherine Hepburn – another Broadway actress making her screen debut. Sadly, Billie’s husband died while she was still filming. In 1933, Billie played a scatter-brained society hostess in Dinner at Eight, also directed by George Cukor. Although under contract to MGM, she was considered ‘too old’ to play herself in The Great Ziegfeld, a sanitised 1936 biopic. Myrna Loy was cast as the young Billie. Billie appeared opposite Cary Grant in Topper (1937), and her performance in Merrily We Roll Along (1938) earned her an Oscar nomination. In 1939, Billie played her most beloved film role, as Glinda the Good Witch in The Wizard of Oz. By the 1940s, Billie had moved into radio. In 1950, she played Elizabeth Taylor’s future mother-in-law in Father of the Bride. She became one of the first female talk-show hosts on television, but her failing memory made her decide to leave the stage. Her last screen appearance was in Sergeant Rutledge, a 1960 Western directed by John Ford. Billie Burke died, aged eighty-five, in Los Angeles on May 14, 1970, and was buried at the Kensico Cemetery in Valhalla, Westchester County, New York. A memorial statue stands at her graveside. A park in the suburb of Hastings-on-Hudson is named the Burke Estate. For many years her framed photo was displayed above the exit staircase at the Ziegfeld Theatre, but it vanished after renovations. 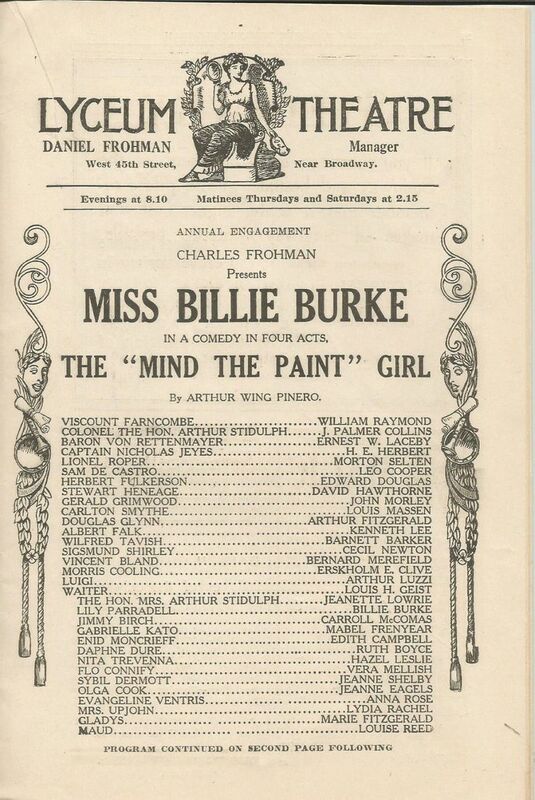 However, an opening night program, bearing a picture of her in The Mind-the-Paint Girl, is still displayed in the lobby of the Lyceum Theatre. I adore Billie Burke. Usually people only know her as Glenda the Good Witch in the Wizard of Oz. Even though she was excellent in that role, her talent was so much greater. She’s elevated many a film, in my opinion.